Aside from ferns, my main research interest is the group of trees known as Pseudopanax, for which I collaborate with Lara Shepherd from the Allan Wilson Centre. Pseudopanax includes the lancewoods and five-fingers. 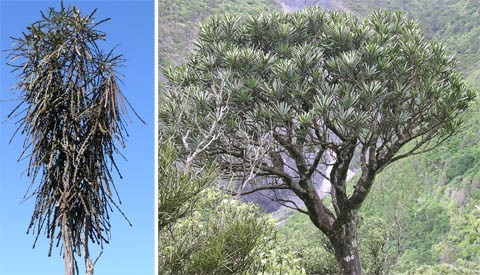 Several of the species are popular in cultivation, including fierce lancewood (Pseudopanax ferox). This species is so named for having bigger ‘teeth’ along the margins of its juvenile leaves than lancewood (Pseudopanax crassifolius). Fierce lancewood, Pseudopanax ferox. Juveniles (left) and adults (right) have very different leaves and habits. Both images by Leon Perrie, Curator. © Museum of New Zealand Te Papa Tongarewa. How are fierce lancewood populations related? In the wild, fierce lancewood has a very discontinuous distribution, with some populations being very isolated. We want to know how the various populations are related to one another. We are using a DNA-fingerprinting method known as “microsatellites” to determine how the various populations are related to one another. The approach is analogous to criminal forensics. Microsatellites are highly variable regions of DNA. Each microsatellite has a number of variants which differ in length. 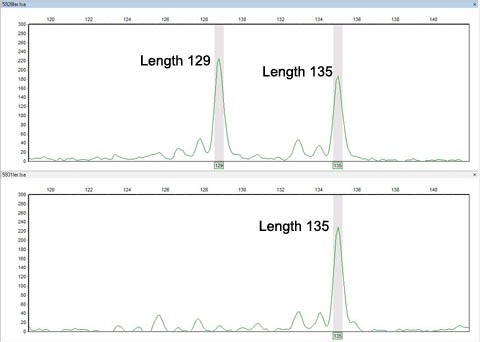 We determine how many DNA nucleotides long the microsatellite variants are in each individual sampled. This tells us how the individuals and the populations they came from are related. At each different kind of microsatellite, each individual has two copies, one inherited from its mother and the other from its father. The two copies in an individual can be the same or different lengths. This is a figure of one particular kind of microsatellite for two individuals. In the upper individual, the two copies are of different lengths: length 129, which is quite uncommon, and length 135 which is common and widespread. In the lower individual, the two copies are both of length 135, which is why there is only one large peak. Our preliminary analyses suggest there are four principal genetic groups within fierce lancewood. There has probably been very little gene-flow between these groups for some time. The four principal genetic groups detected by microsatellite DNA-fingerprinting in fierce lancewood are indicated by different colours. 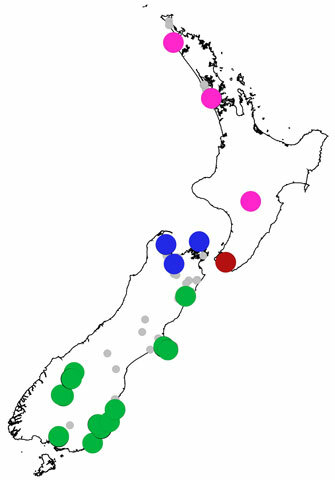 The small grey circles are populations that we haven’t sampled, but which are represented by specimens in the herbarium collections of Te Papa, Auckland Museum, and Landcare Research. One of the four groups, that in the southern North Island (the brown dot), comprises a single population on one hillside! On the other hand, another of the four groups encompasses most of the South Island (from Kaikoura southwards; green dots). The absence of strong genetic subdivision within this group suggests its populations have been more recently connected by gene-flow. This may indicate that fierce lancewood has recently been more continuously distributed in the central and southern South Island, perhaps even until the widespread clearance of lowland forests by humans. Our preliminary analyses also suggest that the central and southern South Island populations of fierce lancewood may have survived the Last Glacial Maximum of the ice-age more or less in situ, rather than being derived from one or a few major refugia. This is consistent with the hypothesis that there was widespread survival of New Zealand’s forests during the ice-age, as we have previously inferred from genetic analyses of the forest fern Asplenium hookerianum. Thanks Leon. I’ll contact Rewi, possibly also Colin Ogle. fruited c. 2 years ago. Pseudopanax ferox seems to be very, very uncommon around Ahipara. I’ve seen only a few individuals there. Your plants might be important genetic stock. Perhaps talk to Otari (or the like) – they might be interested in growing some on (I’d suggest from cuttings if possible, rather than seed).